The first time I read Madame Bovary I was 18 years old. It did not leave a deep impression. Something about bourgeois norms and adultery. 40 years later, I’m surprised to find myself laughing out loud. Some of that laughter is directed at myself. I had somehow conflated the scarlet woman Anna Karenina with Emma Bovary. But Emma is the daughter of a farmer. A simple milkmaid, Emma is vain and silly and romantic in the worst sense of the word. She loves to read novels. It was always love, lovers, mistresses, persecuted women fainting in solitary little houses, postilions expiring at every relay, horses killed on every page, gloomy forests, romantic woes, oaths, sobs, tears and kisses, small boats in the moonlight, nightingales in the groves, gentlemen brave as lions, gentle as lambs, impossibly virtuous, always well dressed, who wept copiously. Charles Bovary doesn’t come off much better. He’s an indifferent student and a timid man whose mother dictates his life until the day he marries Emma. The bliss he derives from marriage is equal only to the scorn it inspires in his blushing bride. Charles’s conversation was as flat as a sidewalk, with everyone’s ideas walking through it in ordinary dress, arousing neither emotion, nor laughter, nor dreams. He had never been curious, he said, the whole time he was living in Rouen to go see a touring company of Paris actors at the theater. He couldn’t swim, or fence, or shoot, and once he couldn’t even explain to Emma a term about horseback riding she had come across in a novel. If Emma is Flaubert’s vehicle for the overheated imagination of a romantic novel reader then Charles is the representative for dull propriety. The stage is set for high comedy. My favorite comic scene comes midway Part II. A seduction scene worthy of your rankest bodice-ripper is interspersed with the prizes awarded at an agricultural fair. At this point, Madame Bovary tips from comedy into tragedy. Emma is no longer merely silly. Her self-indulgence has serious consequences for herself, her husband and their daughter. It’s hard to like her as she willfully deludes herself. He no longer used the words so sweet that they made her cry, as he had in the old days; nor were his caresses so ardent that they drove her mad. So the great love affair in which she had plunged seemed to diminish under her like the water of a river being absorbed into its own bed, and she began to see slime at the bottom. She didn’t want to believe it and redoubled her tenderness. Flaubert toys with the reader’s sympathies, jerking us one way and then the other. Do we admire Emma Bovary or feel bad for her husband? Do we despise Charles so that we can love Emma? Roxana Robinson calls Flaubert the great disrupter. I re-read Madame Bovary to heed the advice of Francine Prose and her list of books to read immediately. She cites Flaubert in her chapter on narration. He’s an author who broke the rules by starting with one narrator and abandoning him. Rule-breaking is a good thing in Prose’s mind. It shows that there are no limits to what a good author can do. The fact that Madame Bovary is still being read 160 years after its first publication should be reason enough to include it in any literary canon. 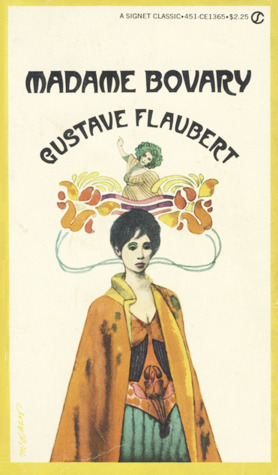 But an even better reason to my mind is all the work Flaubert’s novel has managed to inspire. My first example is Karen Russell. There’s a scene in Madame Bovary where a patient of Charles’s gives a little Italian greyhound to Emma as a token of his gratitude. Russell takes that event and turns it into a story from the perspective of the frightened dog lost on the road to Yonville. It’s called Madame Bovary’s Greyhound. The short story was first published in Zoetrope: All-Story and later anthologized in The Best American Short Stories of 2014. My second example comes from none other than Lydia Davis. Her source of inspiration is a scene that introduces Emma to her new home in the village of Yonville by way of the local church. The event mirrors an incident recorded by Flaubert in a letter to his lover Louise Colet. He wrote the letter while working on Madame Bovary. Lydia Davis has extracted the incident, translated and reshaped it to be her own short story “The Chairs.” It is one of my favorites from her collection Can’t and Won’t. Will I read Madame Bovary for a third time? Ask me in another 40 years.